Ridgefield Schools Directions Employment Sign Me Up! Arts and Crafts - Painting, Drawing, Knitting, Crochet, Jewelry . . . Languages - French, German, Italian, Spanish, and more . . . The best way to reach us at night is through email. The Ridgefield Continuing Education office has moved to the 1st floor of the Town Hall Annex. Click here for directions to the Town Hall Annex - Continuing Education Office and Computer/Technology Lab and Day and Summer classrooms. The Spring to Summer 2019 brochure is here on the web and provides information regarding upcoming course offerings. Use the index to the left to scroll through the web site or Click Here to download the latest brochure in PDF. Extra brochure copies are available at the Town Hall Annex, Town Hall, Ridgefield Public Schools, and area libraries. 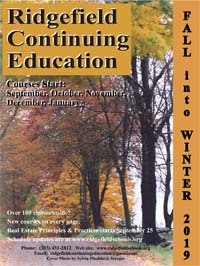 This brochure includes classes starting in late March, April, May, June, July and August. If you are interested in purchasing a Gift Certificate, please eMail: ridgefieldcontinuingeducation@gmail.com or phone (203) 431-2812. You can start registering now! ADVANCED REGISTRATION IS REQUIRED ~ the sooner the better! Classes start at various times year round. Call (203) 431-2812 or click Sign Me Up! for registration information. For over 40 years Ridgefield Continuing Education has provided courses that contribute to people’s employment, wellness, practical skills, and enrichment. Our programs are funded solely by course tuition and we thank the Ridgefield and nearby residents who enroll in our programs for their support. We provide over 100 courses, each tri-mester, that have helped many people achieve success, whether it be employment or language skills, healthy cooking, fitness, local archaeology, history, arts and crafts, gardening, guitar, computers, photography, real estate, house and garden, fitness, wellness, art, knitting, history, and many more topics. Please give some thought to setting aside time each week to explore something you are curious about. Connect with other people as you receive an in-person educational experience as you focus on self improvement and then share your viewpoints with others at a coffee shop or restaurant before or after class. These courses are available to people age 18 and older that live in Ridgefield and neighboring communities. Please browse our course selection and let us know if you have any suggestions. The Continuing Education office is in the Town Hall Annex (to the left of Yanity Gym). This location houses the Continuing Education office, all day classes, and all day and evening computer classes, and some of the other evening classes. Evening classes are located in several school buildings. • Thank you to the Ridgefield Public Schools and the Town of Ridgefield for providing our facility space. • Thank you to both Sylvia Sturges and Tom Bruno for the beautiful photos for our cover. • Register early to increase course choices. Don't lose out on a class because you procrastinated and found out that it was already cancelled or full. • We appreciate it when you pay by check because it helps us keep costs down. • We appreciate it when you register early so that we can let the teacher know early if their class is running. It makes it easier for the teacher to plan their class. •	Please do not bring any food, particularly peanuts, nuts, or products containing nuts to class. •	Please mark dates, time, and location on your calendar. Date and location changes will be updated on the web site and students will be notified. Please contact me if you have any questions. Thank you for your participation and consideration. To reach us - feel free to contact us anytime. If you reach an answering machine, please leave a detailed message. We're either on another line or teaching a class and will contact you as soon as possible. You may send us feedback at any time. Fill out our Survey and either Email, Mail, or Phone it to us. Postal Address - note the office IS NOT at this location (see In-Person Office Location below). Continuing Education, Town Hall Annex, 66 Prospect Street - 1st floor. Click here for directions to the Town Hall Annex. If the weather is bad and there is no weather message here, try www.ridgefield.org . The information will be on the main page. If the weather gets bad after the close of school, check here and (203) 431-2812 for a message. Thank you. When Ridgefield Schools are Closed, Continuing Education Classes are Postponed for both day and evening, regardless of location. Please attend your next scheduled class. A makeup session will be added to the end of the session and will be posted with that course description on this web site. When Ridgefield Schools have an Early Dismissal, Continuing Education Classes that start at 1:00 p.m. (for both afternoon and evening) or later are Postponed to the next class. Please attend your next scheduled class. A makeup session will be added to the end of the session and will be posted with that course description on this web site. When Ridgefield Schools have a Delayed Opening, Continuing Education classes that start before 9:30 a.m. are postponed. Please attend your next scheduled class. A makeup session will be added to the end of the session and will be posted with that course description on this web site. Classes starting at 9:30 a.m. or later will proceed as scheduled.